Here’s an idea you can’t do. Because it probably doesn’t fit your brand. 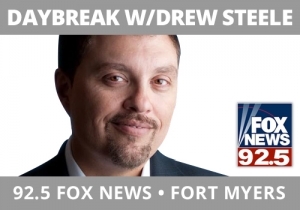 Drew Steele, 92.5 FOX News, Ft. Myers, FL is a conservative talk show host who recognizes that listeners don’t want to wake up and hear him pounding on the table all day, being angry at the Democrats. Drew has always been sensitive to the emotional needs of his audience at that time of day and recognizes that having fun with the topics that fit resonates more efficiently with his audience. The new book “Fire and Fury” is a top shelf topic with Drew’s conservative audience. From the perspective that there are a lot of holes within the stories of the book, Drew decided to actually put some holes in the book by spending the week giving away to listeners the chance to meet him at a gun range and shoot at the tome. You own topics by doing big things with them. This was an idea to cause talk amongst his listeners because it lived on the fringe and captured where his audience was emotionally about the topic. Here’s the promo that ran all week so they could get credit for doing it. You can see a video of it here from TV coverage.